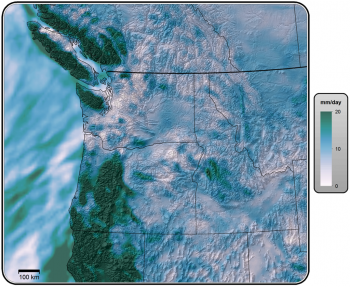 A database of dynamically downscaled climate projections for the Pacific Northwest, produced using the Weather Research and Forecasting (WRF) regional climate model, and implemented at a temporal resolution of 6 hours and a spatial resolution of 12 km. Several of the climate projections have also been used to produce hydrologic change projections at a spatial resolution of 1/16th degree (~30 km2). The Weather Research and Forecasting (WRF) model is a state-of-the-science mesoscale weather prediction model serving the needs of both operational forecasts and atmospheric research. Recently, the model has been developed to conduct simulations of regional climate for studies focused on the finer-scale impacts of climate change (see Salathé et al., 2010 and Salathé et al., 2013 for details). This is sometimes referred to as “dynamical downscaling,” in which a physical climate model (in this case, WRF) is run with boundary conditions taken from the global model being downscaled. Figure 1 Simulated difference in the 30-year average annual maximum wintertime precipitation from current climate (1970-1999) to future climate (2030-2069) conditions. Topographic features indicated by relief shading. Figure source: Salathé et al. (in review). The WRF model faithfully represents the spatial and temporal distribution of mesoscale atmospheric dynamics and the orographic effects that exert a large influence over the regional climate and extreme precipitation events (Figure 1; Salathé et al., in review). Furthermore, a key advantage of the WRF model is that it successfully simulates the significant large-scale climatic conditions of the region, including the winter storms known as atmospheric rivers, which are attributable to major flooding events in the western Cascades. The Climate Impacts Group (CIG) has implemented several historical and future simulations using WRF. In addition, several of these have been adjusted to 1/16 degree resolution (~30 km2) and used to drive hydrologic simulations over the Pacific Northwest. The climate data generated from the dynamically downscaled global model were applied to a macro-scale hydrologic model Variable Infiltration Capacity (VIC) to estimate projected changes in flood statistics (Salathé et al. in review). The WRF model consistently projects increases in extreme precipitation over the northwestern U.S. Such projected changes could have implications for the timing and magnitude of flooding regimes in the region (Figure 2). Figure 2 Projected changes in annual daily peak flow dates and magnitude using regional scale climate model for a mid-elevation watershed (Skagit River at Mt Vernon) for two time periods: 2010-2039 (left) and 2040-2069 (right). Blue and red lines show mean peak flow date for historical and future time periods respectively. Figure source: Salathé et al. (in review). The WRF model was implemented over the Pacific Northwest at a temporal resolution of 6 hours and a spatial resolution of 12 km (see Salathé et al., 2010 and Salathé et al., 2013 for details). The simulations use nested grids at 36-km and 12-km spacing. Climate simulations are performed using 6-hourly forcing fields from global models. The outer 36-km nest receives boundary conditions and interior nudging from the global fields; the inner 12-km nest is forced at its boundary by the outer nest. The model performance over the Northwest region has been extensively evaluated using simulations forced by reanalysis fields and is capable of resolving the fine scale structure of storms and their effects on precipitation in complex terrain (Zhang et al. 2009; Duliere et al. 2011). In particular, the model successfully simulates important large-scale features of Pacific Northwest winter storms, such as atmospheric rivers, which have been shown to be the major cause of the largest floods in rivers that drain the windward (western) slopes of the Cascades (Neiman et al. 2011; Warner et al. 2012). Figure 3. 6-hour accumulated precipitation simulated by ECHAM5/WRF for extreme precipitation events on 27 Nov 2030. Left panel shows results for the outer, 36-km domain; right panel show results for the inner, 12-km domain. The daily downscaled output from the WRF model (precipitation, temperature and wind speed) was used to drive the Variable Infilitration Capacity (VIC) hydrologic model. The VIC model is a macro-scale, fully-distributed model that resolves the water balance at the grid cell resolution (approximately 35 km2). Based on simulated daily flows, the annual daily peak flows and peak flow dates (the day when the peak flow occurred, starting from October 1st) were for each of the 297 regional streamflow sites included in this study. The annual peak flows were used to estimate the 100-year flood event at three time periods: historical (1970 – 1999), near future (2010 – 2039) and mid-century (2040 – 2069). To drive the hydrologic model, we use simulated WRF daily output of total precipitation, maximum and minimum temperature, and mean wind speed. Although regional scale climate models represent the important topographic features of the PNW and the mesoscale structure of storms that control flooding in PNW rivers better than global models, RCM simulations are still subject to substantial biases resulting from deficiencies in both the global forcing fields and the regional model (Wood et al. 2004; Christensen et al, 2008). To obtain acceptable hydrologic simulations, these biases must be removed when using RCM results in impacts studies. In addition, to link the WRF results to the VIC hydrologic model, the simulations require additional downscaling from the 12 km WRF grid to the 1/16th degree VIC grid. Following the approach of Hamlet et al. (2010; see chapter 8 for details), raw daily output from the hydrologic model are summarized at monthly time scales for all variables and at annual time scales for streamflow and snowpack statistics (e.g., snow season length, 100-year flood magnitude, etc.). Please contact Guillaume Mauger for access to the data from this project. This research was funded through the US Army Corps of Engineers. Salathé, EP, AF Hamlet, CF Mass M Stumbaugh, S-Y Lee, R Steed: Estimates of 21st Century Flood Risk in the Pacific Northwest Based on Regional Scale Climate Model Simulations. Submitted to J. Hydrometeorology. DRAFT report available online here. Dulière, V., Zhang, Y., & Salathé Jr, E. P. (2011). Extreme Precipitation and Temperature over the US Pacific Northwest: A Comparison between Observations, Reanalysis Data, and Regional Models. Journal of Climate, 24(7), 1950-1964. Kalnay, E., Kanamitsu, M., Kistler, R., Collins, W., Deaven, D., Gandin, L., … & Joseph, D. (1996). The NCEP/NCAR 40-year reanalysis project. Bulletin of the American meteorological Society, 77(3), 437-471. Neiman, P. J., Schick, L. J., Ralph, F. M., Hughes, M., & Wick, G. A. (2011). Flooding in Western Washington: The Connection to Atmospheric Rivers*. Journal of Hydrometeorology, 12(6), 1337-1358. Tohver, I.M., Hamlet, A.F., Lee, S-Y. In press. Impacts of 21st century climate change on hydrologic extremes in the Pacific Northwest region of North America. Journal of the American Water Resources Association. In press. Warner, M. D., Mass, C. F., & Salath, E. P. (2012). Wintertime Extreme Precipitation Events along the Pacific Northwest Coast: Climatology and Synoptic Evolution. Monthly Weather Review, 140(7). Zhang, Y., Dulière, V., Mote, P. W., & Salathé Jr, E. P. (2009). Evaluation of WRF and HadRM Mesoscale Climate Simulations over the US Pacific Northwest. Journal of Climate, 22(20), 5511-5526.